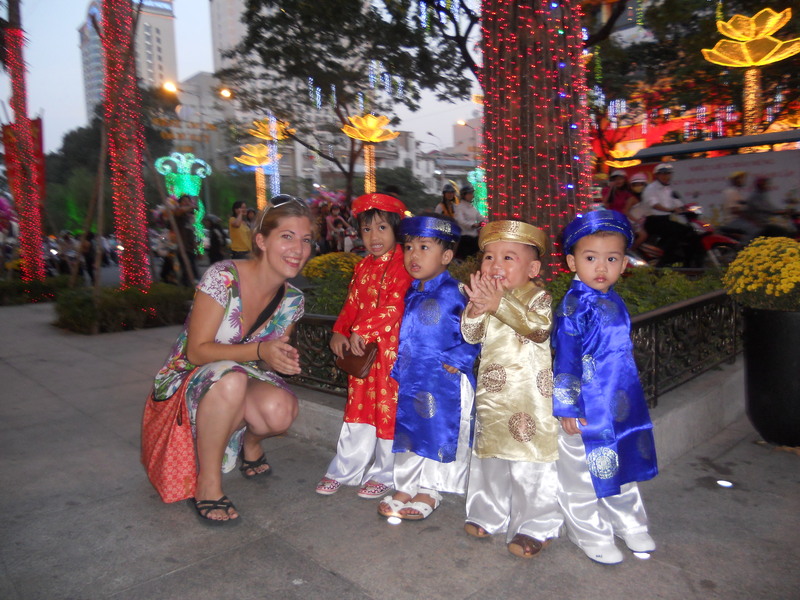 We happened to arrive during the eve of Tet, Vietnam’s biggest holiday of the year when they celebrate Lunar New Year. It was a pretty exciting time. The whole city was covered in festive New Year’s signs with red decorations and cat images, since 2011 is the Year of the Cat (however, according to China, 2011 is the Year of the Rabbit…). To our luck, Karri’s Vietnamese friend Michelle was home for the holidays and offered to show us around on her motorbike. I gotta say, at first I was scared. Traffic in Southeast Asia is crazy as it is, but Ho Chi Minh City was especially bad. The city in itself is crowded but in the streets motorbikes are SWARMING! I don’t think I’ve ever seen so many motorbikes in my life, it seemed as if nearly no one had a car. Anyway, not wanting to be rude, Karri and I hopped on and off we went on our Saigon adventure! The whole evening was really fun. Aside from the rush of the motorbike ride (only a few near misses :)), we joined the rest of the city in an evening Tet promenade in the city center. The whole street had been blocked off and decorated, and people from all over got dressed up in their finest to stroll down it and meet each other. The atmosphere, though crowded, was extremely happy and festive, it was hard not to enjoy the positive energy. 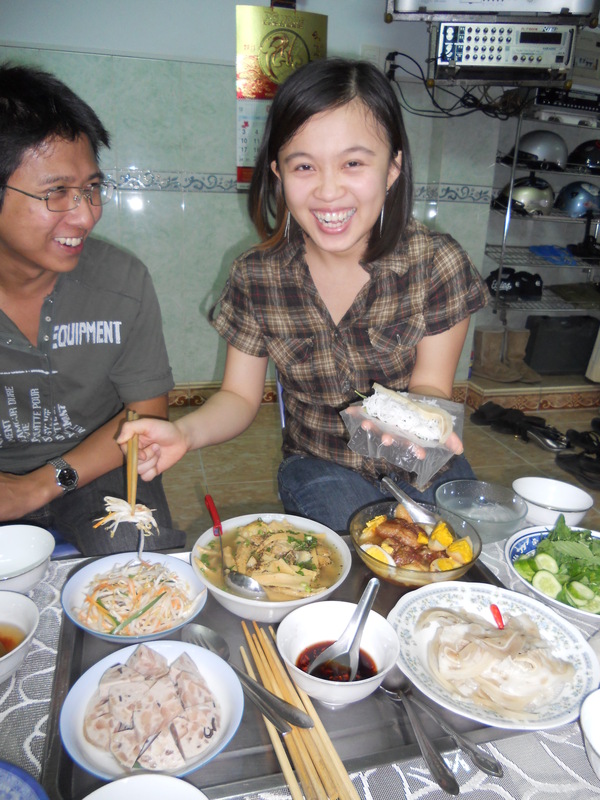 Afterward, Michelle invited us to her house for an authentic Vietnamese dinner. In front of us we found a spread of rice, sauces, meat and vegetables as well as this transparent paper-like food called rice paper. Michelle showed us how to dip the rice paper in water to make it clear and soft then wrap all the food inside of it to make a roll. Her rolls were definitely much tidier than mine, but in the end, they were still fun and yummy :). On the morning of day two, my friend Danielle flew in to join us for the remainder of the trip. Since we were planning on taking day trips outside the city the last two days, we decided to see as much of Saigon as possible while we could. Though many of the shops and restaurants were closed for the holidays, the three of us were actually able to see quite a bit. We walked all over, taking in the French colonial architecture, Notre Dame Cathedral, the Tet market and a cockfight on a sidewalk in broad daylight. By far the most interesting event, however, was the War Remnants Museum, where we spent most of the afternoon. 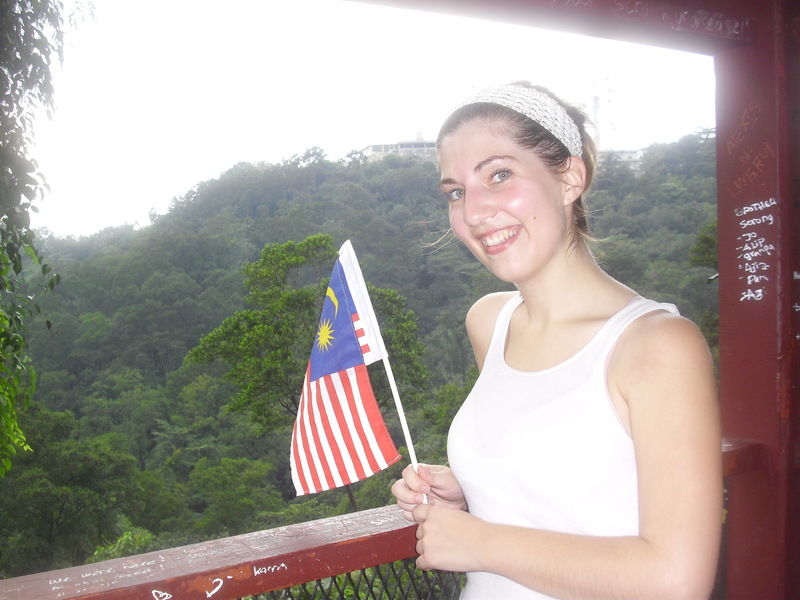 This was the most un-objective, propaganda-laden place I have ever been to! To start, the entire first floor is full of images of Vietnam War protests throughout the world and letters from American soldiers and political figures expressing their regret and sympathy to Vietnam. The second floor was basically a large exhibit on Agent Orange followed by dozens of pictures of deformed adults and children and their stories. I honestly can’t remember all that was on the last floor, I just remember seeing a lot of pictures of dead bodies and stories about the atrocities the “imperialist” Americans committed. I know a lot of bad things went down in Vietnam and that history has a different perspective from the other side, but come on! From this museum, you’d think North Vietnam was some sort of angelic victim who was only defending its country. There was virtually no mention of the Cold War, the Communism/Capitalism struggle or anything else that led up to the war, nor was there any mention of the atrocities the North or the Viet Cong committed. The only real positive thing that I got from that museum was a desire to learn more about the war (objectively), and I am now reading up on it.